When Gulliver landed on the shores of Brobdingnag they shouted, 'Go Big! Or Go Home!' and so his travels continued. Travel no further in search of a colossal coffee maker, the Curtis G3 TP15T Twin ThermoPro Brewer can make up to 302 cups of coffee per hour. Twin servers keep brewed coffee ready to serve plenty of venti-coffee loving average or giant-sized customers. Each ThermoPro holds up to 1.5 gallons each, three ginormous gallons total. 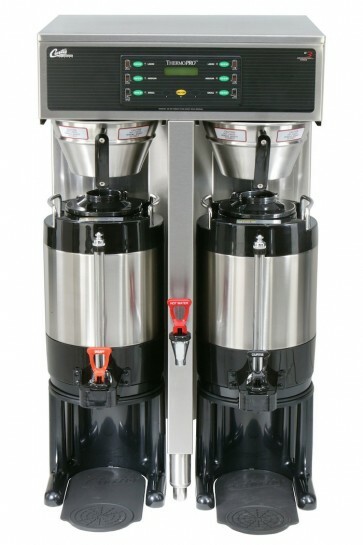 Regular cleaning and preventive maintenance is essential in keeping your coffee brewer looking and working like new. CAUTION – Do not use cleansers, bleach liquids, powders or any other substance containing chlorine. These products promote corrosion and will pit the stainless steel. USE OF THESE PRODUCTS WILL VOID THE WARRANTY. Wipe exterior surfaces with a damp cloth, removing spills and debris. Slide the brewcone out and clean it. Thoroughly soap the sprayhead area with a mild detergent solution. Rinse and dry the brewcone and sprayhead area. Drain drip trays of coffee. Turn off unit at the power switch, behind the unit. Allow the brewer to cool. Clean the sprayhead and dome plate area. a. Remove the sprayhead, unscrewing counterclockwise from the dome plate. b. Open the sprayhead with a thin bladed screwdriver and clean inside. c. Thoroughly clean and rinse the dome plate area. d. Clean the brewcone rails with a brush soaked with detergent. Rinse, then dry the area. Assemble and attach the spray head. Rinse out the liner with hot water to remove coffee from the server. Fill the liner with a mild detergent solution and let it stand for 10 to 15 minutes. Completely drain out the soapy solution from the liner. Fill the airpot with clean water to rinse out any detergent left inside the unit. Repeat this rinsing several times until the water runs clear and free of all traces of detergent solution. Twist the faucet handle assembly counterclockwise to remove it from the faucet. Disassemble the parts from the faucet handle by pressing down on the seat cup while unhooking the handle from the center stem. Clean the seat cup, and other faucet parts with a mild detergent solution. When clean, rinse the parts. Inspect for cracks or tears in the seat cup. Replace if damaged. Clean the glass gauge. a. Remove the sight glass cover by pulling up and off from the server. b. Using the narrow brush provided for this purpose, brush out the inside of the glass with a mild detergent solution. Rinse the sight glass tube of all detergent. c. Replace the sight glass. Make sure silicone seals are seated. d.	Pay special attention to the small gauge glass liquid level hole on the body of the faucet. You can brush this out with a small pipe cleaner.